A pizzeria owner in Pennsylvania sought to sabotage competing shops by infesting them with mice, police say. Nikolas Galiatsatos has been charged with animal cruelty and other offences in Upper Darby, near Philadelphia. He was arrested after officers found a man had stuffed a sack containing live mice into the space above a ceiling panel in a pizzeria bathroom. Investigators said Mr Galiatsatos, 47, had been grappling with a mouse problem in his own shop, Nina's Bella Pizzeria. "We have never had anything like this where mice have been used as an instrument of crime," Upper Darby Police Supt Michael Chitwood told reporters. "This is food terrorism by mice." According to local media reports, on Monday a man walked into Verona Pizza in the suburban town and asked to use the bathroom. The owner then saw footprints on the toilet and noticed a ceiling panel had been disturbed. Above the panel, the owner found a bag. Fearing the bag contained drugs, he turned it over to two police officers who happened to be eating lunch there. In the bag were three white mice, Supt Chitwood said. Police watched the same man walk across the street to Uncle Nick's Pizza, dropping a bag into the rubbish there. 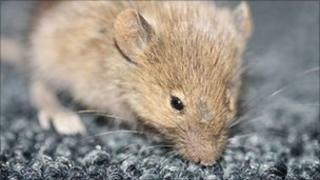 In the bag, police found five live mice and one dead one. On Monday afternoon Mr Galiatsatos remained in police custody, the Associated Press reported. He has not commented on the charges. Police said the mice had been purchased from a pet store.